So today, I am writing to suggest that if you live near one of the facilities, you may want to build yourself a nuclear go bag. 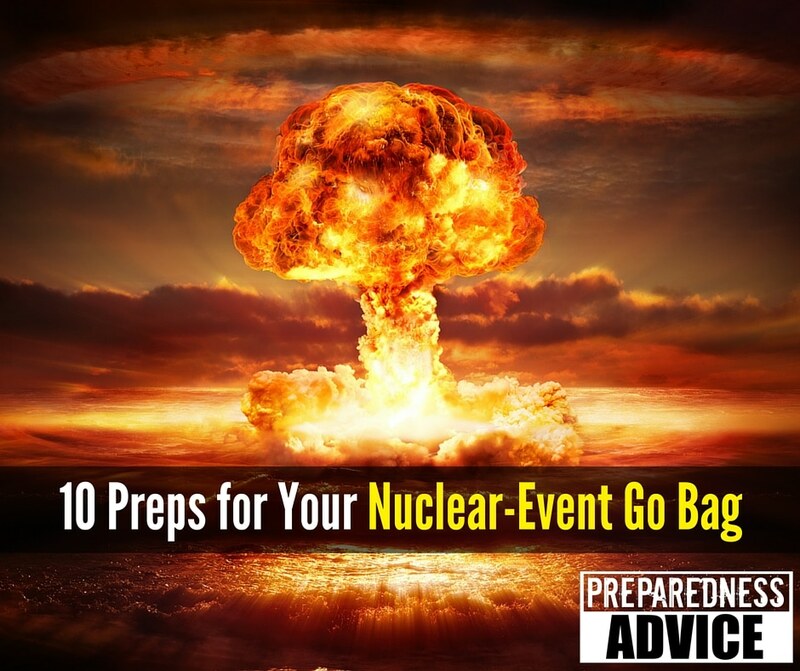 This is a bag that you would grab in addition to your bug out bag if you had to flee your home because of a dirty bomb, power plant accident, or some other nuclear incident. This bag should also contain most of the items you would need to survive if you have to shelter in place because of radiation. Keep in mind that location might be your home, but just as easily, your workplace, school, or vehicle. A radiation detector – This can be something as simple as a homemade Kearny Fallout meter as shown in Nuclear Warfare Survival skills. You can also get personal radiation detectors such as the RADTriage, which is a U.S. Military-grade personal dosimeter. This detects radiation exposure in the event of a dirty bomb or a nuclear reactor accident, such as Fukushima and Chernobyl. This is a wallet size card that requires no batteries. Personally, I have one of the Old Civil Defense Radiation Detectors sets that were made for the cold war. I was able to find it through connections with a volunteer fire department. Pregnant & breastfeeding women 130 mg, one dose onlyAdults over 40 should not take KI since they have the lowest chance of developing thyroid cancer and are more likely to have allergic reactions.If your radiation detector indicates continued exposure, children and adults should take an additional dose. Do NOT give additional doses to newborns or pregnant and breastfeeding women. A good quality gas mask with extra filters for every member of your family. Spend some time in researching these. You need masks that will prevent radioactive particles from entering your lungs. Some gas masks have filters that are only good for less than an hour, once activated. This might be fine for Israeli citizens rushing to a nearby bomb shelter, but for Americans, it probably wouldn’t be enough. Have one or two backup filters for each mask. A good rain suit consisting of a waterproof hooded jacket, pants and boots plus gloves. This one is nothing fancy but would get the job done of protecting you. You need one for every member of you family. A good size sheet of plastic to help you seal opening into a room in a building to help keep radioactive particles out. A roll of heavy duty black plastic will be much more effective than black trash bags. Get it at a Lowe’s or Home Depot. Duct tape, lots of it, if for some reason you have to go outside in a fallout area, you can use it around the openings in your rain suite to help keep dust out. It can also be of use if you have to seal a room. N95 particulate masks will help to keep you from inhaling fallout particles. Spend some time wearing a mask like this, just to get used to the sensation. Some people describe feeling suffocated if they aren’t used to wearing a face mask. Also, adjust the mask to fit your face. Soap, sponges and/or a bristled brush (vegetable scrubbing brush) for decontaminating family members. A good bag to store everything in. It will teach you how to build a survivable shelter. Don’t forget to read the links in yesterday’s post. Every item on this list, with the exception of the radiation detector and potassium iodide tablets, have multiple uses in many different scenarios, so the expense in putting this kit together is justifiable. Take a bit of time and put this nuclear go bag together. If a nuclear emergency occurs these items will help you whether you shelter in place or bug out. This entry was posted in nuclear and tagged fallout, gas mask, n95, nuclear, nuclear go bag, Radiation. Bookmark the permalink. Having materials for expedient field decontamination are also helpful. This article details making your own baby wipes from paper towels and common household products. Lacking the pre-packaged body wash you can make a useful expedient solution using water, baby shampoo and a bit of food grade mineral oil USP or baby oil. Nice article. I would, however, add that the above protections are meant mainly for Alpha and Beta particles. While scrubbing, washing, and using the potassium iodide pills to saturate your thyroid glands, shielding is the only effective way to protect oneself from gamma radiation. For example, 1/4 inch of lead, .7 inches of steel, 2.4 inches of concrete, or 3.3 inches of packed earth will reduce gamma radiation by half. http://liteform.com/ has links to all of their products.